Crazy weather is nothing new for those of us that grew up or live on the Great Plains. I have written about tornadoes and temperature shifts on this blog. This summer has gotten off to a rather inauspicious start as northeast Nebraska has made national headlines for multiple tornadoes–one leveling a majority of the town of Pilger. Two people lost their lives, hundreds of homes were damaged or destroyed, livestock were injured or killed and crops were scoured out of existence. A wide angle view of the tornado damage at the town of Pilger. Click on it to make it larger. 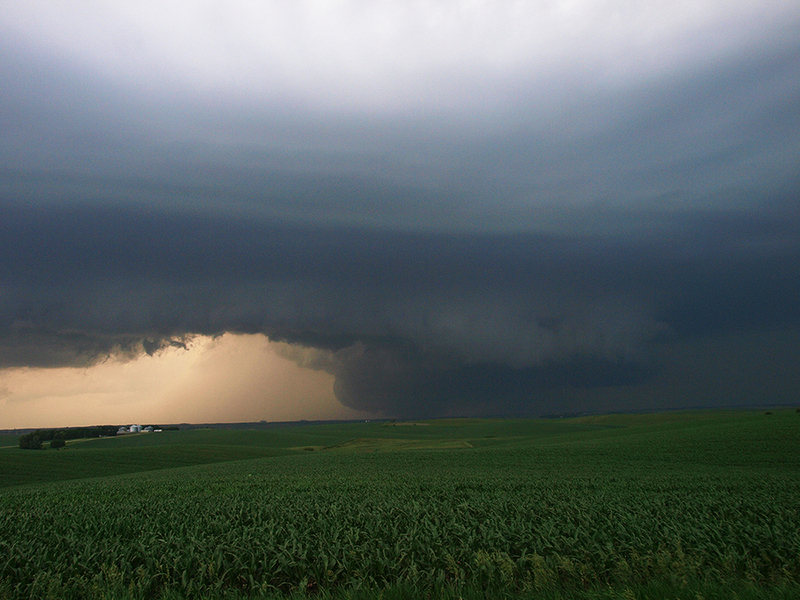 This tornado touched down near Coleridge, Nebraska on June 17, 2014. Our close encounter was on June 17. We were sitting at a baseball game (our usual perch on June evenings). The previous nights’ storms left enough rain on our home field that the games were switched to the visiting team instead (with the second game in the series to be switched back). Most of us were watching storm clouds overhead and nervous because of the lightning. All of a sudden, every cell phone buzzed with an unmistakable emergency alert. “Tornado warning”.This included 50+ phones, which was an eerie and frightening sound since we were in such a vulnerable location. Older children were dispatched to collect their young siblings from the park play area. Parents begin to bring up weather information on their phones. Coaches conferred in the dugout and players chafed at the delay. At first, it looked like the storm was moving away from us. Regardless of direction, we had a confirmed tornado within a dozen miles of our location and a large group of people out in the open. The games were cancelled. Getting out of town was more challenging than it first appeared. An east-west federal highway directly linked our location with home; however, a bridge-under-construction had necessitated a large detour to the north. This detour was directly under the tornado. Being good, rural folk, we simply took gravel roads toward the south and hoped for the best….listening to the radio and watching radar on my tablet to best choose our route. Once we were convinced that we were out of harm’s way, a hilltop location was found to stop and view the destructive power of nature. This was an amazing storm. Huge. Slow. Growing. Dark. The tornado damage, according to our County Emergency Management people resulted in 65 houses destroyed or damaged, 59 properties, 28,000 acres and some livestock loss. Another source reported 60 center pivots destroyed or damaged. The Cedar- Dixon county tornado took place about 28 hours after the Pilger event. The Cedar-Dixon Super Cell is reported to have produced at least four twisters. One notable twister approached Laurel from the north and according to the National Weather Service, stalled out for nearly an hour two miles north of town. If you have not already, please consider donating time, money, or needed items to any of these communities. Let us hope and pray that the rest of the summer of 2014 is quiet, weather-wise.